The Sonim XP3300 Force has been around for a while, but it recently hit the headlines when it was officially certified as the world's toughest phone, when it survived a 25 metre drop onto concrete without breaking. 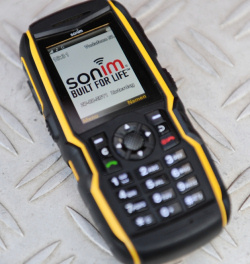 We've covered Sonim handsets before, such as the XP2, but Sonim are determined to make successive generations tougher and tougher, and the XP3300 Force is IP68 certified, so it is completely dustproof and can survive in up to 2 metres of water for one hour. The XP3300 is also MIL SPEC-810G certified, so it can survive a drop of at least two metres onto concrete (or more). The display is coated with Gorilla Glass to make it scratch-resistant, and the keypad has been arranged to make it easy to use while wearing gloves. This is a GSM phone with no 3G data, so the best download speed you will get is using EDGE (if available). 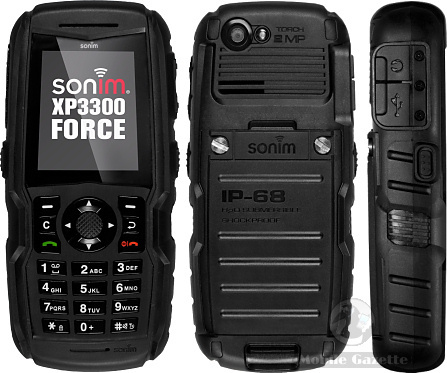 But if you want 3G, there's the Sonim XP5300 Force which is almost identical and is due to be available very soon. The display is quite small, so this isn't a great device for web surfing anyway. It does come with a built-in GPS application called City Cruiser which looks like a practical handheld navigation system, although it requires a data connection and 3G might be a little better. Alternatively, you could look at an offline GPS application such as TrekBuddy which might be of use if you really want to go off the beaten track. We mentioned the small screen size on the XP3300, and the 2" 240 x 320 pixel panel is certainly smaller than most phones on the market. However, bigger screens are easier to break and if you want something really tough then you have to compromise on the screen size. There are some ruggedised smartphones around such as the upcoming Motorola DEFY+ and Samsung Galaxy Xcover, but they are nowhere near as tough as this Sonim. Other features include an FM radio, multimedia player, microSD slot, Bluetooth and a basic 2 megapixel camera. There's a built-in flashlight and extra-loud audio so it can be used in noisy conditions, plus a noise cancellation system. It's not a smartphone, but the Sonim XP3300 Force does support Java so you can download applications for that platform. Software includes a version of the Opera Mini web browser and a standard email client. Inside is a big 1750 mAh battery that can give up to 24 hours talktime, 33 days standby time or 10 hours navigation time. It's a big beast at 126 x 60 x 25mm and 185 grams, due mostly to the shockproofing and waterproofing. The standard sales package includes a charger, belt clip, screwdriver, wired headset, data cable and a 3.5mm headset adapter. It's an impressively tough device, but an expensive one. The XP3300 currently retails for about £300, €350 or $500. The 3G version (the XP5300) seems to be listing for around £380, €400 or $700. That's a lot of money for a basic phone, twenty times the price of the forthcoming ultra-basic Nokia 100 and even more expensive than the powerful DEFY+ slightly ruggedised smartphone. Whether or not you are prepared to pay this price probably depends on what you use your phone for and what sort of environment it will be exposed to. The XP3300 Force looks like a very good device in its own way, but we'd quite like to see what Sonim could do with an Android smartphone though, we think it would probably knock spots off the competition!